For the airline company, see Canadian North. Northern Canada, defined politically to comprise (from west to east) Yukon, Northwest Territories, and Nunavut. Northern Canada, colloquially the North, is the vast northernmost region of Canada variously defined by geography and politics. Politically, the term refers to three territories of Canada: Yukon, Northwest Territories, and Nunavut. Similarly, the Far North (when contrasted to the North) may refer to the Canadian Arctic: the portion of Canada that lies north of the Arctic Circle, east of Alaska and west of Greenland. This area covers about 39 percent of Canada's total land area, but has less than 1 percent of Canada's population. These reckonings somewhat depend on the arbitrary concept of nordicity, a measure of so-called "northernness" that other Arctic territories share. Canada is the northernmost country in the Americas (excluding the neighbouring Danish Arctic territory of Greenland which extends slightly further north) and roughly 80% of its 35 million inhabitants are concentrated along its southern border with the United States. Those parts of Northern Canada (dark green areas within the red line) considered to be part of the Arctic Region according to average temperature in the warmest month. Political definition of Northern Canada - the "territories" of Canada Barren Grounds and tundra are shown in light blue, and the taiga and boreal forest in dark blue. The north is divided ethnographically into the Inuit living predominately in the "Arctic" region and the First Nations living predominately in the "Subarctic". As a social rather than political region, the Canadian north is often subdivided into two distinct regions based on climate, the near north and the far north. The different climates of these two regions result in vastly different vegetation, and therefore very different economies, settlement patterns, and histories. A boreal forest landscape in Northern Quebec. The "near north" or subarctic is mostly synonymous with the Canadian boreal forest, a large area of evergreen-dominated forests with a subarctic climate. This area has traditionally been home to the Indigenous peoples of the Subarctic, that is the First Nations, who were hunters of moose, freshwater fishers and trappers. This region was heavily involved in the North American fur trade during its peak importance, and is home to many Métis people who originated in that trade. The area was mostly part of Rupert's Land or the North-Western Territory under the nominal control of the Hudson's Bay Company (HBC) from 1670–1869. The HBC's claim was purchased by the Canadian government in 1869, and shortly thereafter the government made a series of treaties with the local First Nations regarding land title. This opened the region to non-Native settlement, as well as to forestry, mining, and oil and gas drilling. Today several million people live in the near north, around 15% of the Canadian total. Large parts of the near north are not part of Canada's territories, but rather are the northern parts of the provinces, meaning they have very different political histories as minority regions within larger units. A typical tundra landscape in Nunavut. The "far north" is synonymous with the areas north of the tree line: the Barren Grounds and tundra. This area is home to the various sub-groups of the Inuit, a people unrelated to other Aboriginal peoples in Canada. These are people who have traditionally relied mostly on hunting marine mammals and caribou, mainly barren-ground caribou, as well as fish and migratory birds. This area was somewhat involved in the fur trade, but was more influenced by the whaling industry. This area was not part of the early 20th century treaty process and aboriginal title to the land has been acknowledged by the Canadian government with the creation of autonomous territories instead of the Indian reserves of further south. Very few non-Aboriginal people have settled in these areas, and the residents of the far north represent less than 1% of Canada's total population. The far north is also often broken into west and eastern halves. The eastern Arctic which means the self-governing territory of Nunavut (much of which is in the true Arctic, being north of the Arctic Circle); Nunavik, an autonomous part of the province of Quebec; Nunatsiavut, an autonomous part of the province of Newfoundland and Labrador; and perhaps a few parts of the Hudson Bay coast of Ontario and Manitoba. 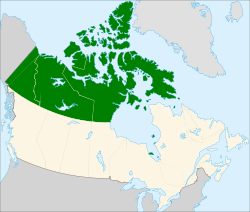 The western Arctic is the northernmost portion of the Northwest Territories (roughly Inuvik Region) and a small part of Yukon, together called the Inuvialuit Settlement Region. Since 1925, Canada has claimed the portion of the Arctic between 60°W and 141°W longitude, extending all the way north to the North Pole: all islands in the Canadian Arctic Archipelago and Herschel, off the Yukon coast, form part of the region, are Canadian territory and the territorial waters claimed by Canada surround these islands. Views of territorial claims in this region are complicated by disagreements on legal principles. Canada and the Soviet Union/Russia have long claimed that their territory extends according to the sector principle to the North Pole. The United States does not accept the sector principle and does not make a sector claim based on its Alaskan Arctic coast. Claims that undersea geographic features are extensions of a country's continental shelf are also used to support claims; for example the Denmark/Greenland claim on territory to the North Pole, some of which is disputed by Canada. Foreign ships, both civilian and military, are allowed the right of innocent passage through the territorial waters of a littoral state subject to conditions in the United Nations Convention on the Law of the Sea. The right of innocent passage is not allowed, however, in internal waters, which are enclosed bodies of water or waters landward of a chain of islands. Disagreements about the sector principle or extension of territory to the North Pole and about the definition of internal waters in the Arctic lie behind differences in territorial claims in the Arctic. This claim is recognized by most countries with some exceptions, including the United States; Denmark, Russia, and Norway have made claims similar to those of Canada in the Arctic and are opposed by the European Union and the U.S. This is especially important with the Northwest Passage. Canada asserts control of this passage as part of the Canadian Internal Waters because it is within 20 km (12 mi) of Canadian islands; the U.S. claims that it is in international waters. Today ice and freezing temperatures make this a minor issue, but climate change may make the passage more accessible to shipping, something that concerns the Canadian government and inhabitants of the environmentally sensitive region. Similarly, the disputed Hans Island (with Denmark), in the Nares Strait, which is west of Greenland, may be an indication of challenges to overall Canadian sovereignty in the North. The western Canadian Arctic early June 2010. While the largest part of the Arctic is composed of permanent ice and tundra north of the tree line, it encompasses geological regions of varying types: the Innuitian Mountains, associated with the Arctic Cordillera mountain system, are geologically distinct from the Arctic Region (which consists largely of lowlands). The Arctic and Hudson Bay Lowlands comprise a substantial part of the geographic region often considered part of the Canadian Shield (in contrast to the sole geological area). The ground in the Arctic is mostly composed of permafrost, making construction difficult and often hazardous, and agriculture virtually impossible. The Arctic watershed (or drainage basin) drains northern parts of Manitoba, Alberta and British Columbia, most of the Northwest Territories and Nunavut as well as parts of Yukon into the Arctic Ocean, including the Beaufort Sea and Baffin Bay. With the exception of the Mackenzie River, Canada's longest river, this watershed has been little used for hydroelectricity. The Peace and Athabasca Rivers along with Great Bear and Great Slave Lake (respectively the largest and second largest lakes wholly enclosed within Canada), are significant elements of the Arctic watershed. Each of these elements eventually merges with the Mackenzie so that it thereby drains the vast majority of the Arctic watershed. Under the Köppen climate classification, much of Northern Canada has a subarctic climate, with a tundra climate in most of the Canadian Arctic Archipelago and an Ice cap climate in Arctic Cordillera. For more than half of the year, much of Northern Canada is snow and ice-covered, with some limited moderation by the relatively warmer waters in coastal areas with temperatures generally remaining below the freezing mark from October to May. During the coldest 3 months, mean monthly temperatures range from −20 °F (−29 °C) in the southern sections to −30 °F (−34 °C) in the northern sections although temperatures can go down to −55 to −60 °F (−48 to −51 °C). Owing to the dry cold air prevalent throughout most of the region, snowfall is often light in nature. During the short summers, much of Northern Canada is snow free, except for the Arctic Cordillera which remains covered with snow and ice throughout the year. In the summer months, temperatures average below 45 °F (7.2 °C) and may occasionally exceed 65 °F (18.3 °C). Most of the rainfall accumulated occurs in the summer months, ranging from 1 to 2 inches (3 to 5 cm) in the northernmost islands to 7 inches (18 cm) at the southern end of Baffin Island. Downtown Whitehorse, Yukon seen from the east side of the Yukon River. Iqaluit, Nunavut is the capital, the only city and largest population centre in Nunavut. Using the political definition of the three northern territories, the North, with an area of 3,921,739 km2 (1,514,192 sq mi), makes up 39.3% of Canada. Although vast, the entire region is very sparsely populated. As of 2016, only about 113,604 people lived there compared to 35,151,728 in the rest of Canada. The population density for Northern Canada is 0.03 inhabitants per square kilometre (0.078/sq mi) (0.07/km2 (0.18/sq mi) for Yukon, 0.04/km2 (0.10/sq mi) for the NWT and 0.02/km2 (0.052/sq mi) for Nunavut) compared to 3.7/km2 (9.6/sq mi) for Canada. It is heavily endowed with natural resources and in most cases they are very expensive to extract and situated in fragile environmental areas. Though GDP per person is higher than elsewhere in Canada, the region remains relatively poor, mostly because of the extremely high cost of most consumer goods, and the region is heavily subsidised by the government of Canada. As of 2006, 52.8% of the population of the three territories (25.1% in Yukon, 50.3% in the NWT and 85.0% in Nunavut) is Aboriginal, Inuit, First Nations or Métis. The Inuit are the largest group of Aboriginal peoples in Northern Canada, and 61.5% of all Canada's Inuit live in Northern Canada, with Nunavut accounting for 52.8%. The region also contains several groups of First Nations, who are mainly Chipewyan peoples. The three territories each have a greater proportion of Aboriginal inhabitants than any of Canada's provinces. There are also many more recent immigrants from around the world; of the territories, Yukon has the largest percentage of non-Aboriginal inhabitants, while Nunavut the smallest. As of 2016[update] census, the largest settlement in Northern Canada is the capital of Yukon, Whitehorse with 25,085. Second is Yellowknife, the capital of the Northwest Territories, which contains 19,569 inhabitants. Third is Iqaluit, the capital of Nunavut, with 7,082. Skyline of Yellowknife, Northwest Territories. Parts of the north have recently boomed due to the amount of natural resources and something of a population increase in cities. Although it has not been on the same scale, some towns and cities have seen population increases not seen for several decades before. Yellowknife has become the centre of diamond production for Canada (which has become one of the top three countries for diamonds). In the Canada 2006 Census, the three territories posted a combined population of over 100,000 people for the first time in Canadian history. Wikimedia Commons has media related to Northern Canada. Look up Northern Canada in Wiktionary, the free dictionary. ^ a b "Population and dwelling counts, for Canada, provinces and territories, 2016 and 2011 censuses – 100% data". Statistics Canada. 2017-02-08. Retrieved 2017-02-08. ^ "Territorial Evolution, 1927". March 18, 2009. Archived from the original on May 9, 2012. ^ Paikin, Zach. "Canada: The Arctic Middle Man" Maritime Executive, 21 August 2014. Accessed: 11 September 2014. ^ Peel, M. C.; Finlayson, B. L.; McMahon, T. A. (2007). "Updated world map of the Köppen–Geiger climate classification" (PDF). Hydrol. Earth Syst. Sci. 11 (5): 1633–1644. doi:10.5194/hess-11-1633-2007. ISSN 1027-5606. ^ a b c d e f g Canada Year Book 1967, p. 57. ^ "Land and freshwater area, by province and territory". www12.statcan.gc.ca. Statistics Canada. 1 February 2005. Archived from the original on 2011-05-24. ^ Government of Canada, Statistics Canada (8 February 2017). "Population and Dwelling Count Highlight Tables, 2016 Census". www12.statcan.gc.ca. ^ a b Government of Canada, Statistics Canada. "Population and dwelling counts, for Canada, provinces and territories, 2011 and 2006 censuses". www12.statcan.gc.ca. ^ a b c Government of Canada, Statistics Canada (15 January 2008). "Statistics Canada: 2006 Aboriginal Population Profile". www12.statcan.gc.ca. ^ a b Government of Canada, Statistics Canada (15 January 2008). "Statistics Canada: 2006 Aboriginal Population Profile". www12.statcan.gc.ca. ^ Sharanya, Sumith (2018-12-13). "14 Best Places to go to Canada | Victoria - Whistler - Quebec City". The best informative topics from around the world. Retrieved 2018-12-30. ^ "Census Profile, 2016 Census: Whitehorse, City [Census subdivision], Yukon and Yukon [Territory]". www12.statcan.gc.ca. Statistics Canada. February 15, 2019. ^ "Census Profile, 2016 Census: Yellowknife, City [Census subdivision], Northwest Territories and Yellowknife [Population centre], Northwest Territories". www12.statcan.gc.ca. Statistics Canada. 15 February 2019. ^ "Census Profile, 2016 Census: Iqaluit [Population centre], Nunavut and Baffin, Region [Census division], Nunavut". www12.statcan.gc.ca. Statistics Canada. 15 February 2019. Mowat, Farley. Canada North, in series, The Canadian Illustrated Library. Toronto: McClelland and Stewart, 1967. 127,  p., copiously ill. in b&w and col.
Canada Year Book 1967 (PDF). Ottawa, Canada: Statistics Canada. 1967. pp. 57–63. Retrieved 6 March 2015.